4.The pebbles will glow for 2-3 hours after leaving the light source.The longer they absorb,the brighter they are. We offer 30 days return without any reason, 90 days replacement if there is any quality problem about the product. Environmentally friendly and: no electricity required! Glowing pebbles absorb and store energy from sunlight or other light sources and illuminate in dark environments. Absolutely safe: Made of high quality resin, non-toxic, tasteless and non-radioactive. Work fine and polished to have no sharp edges. 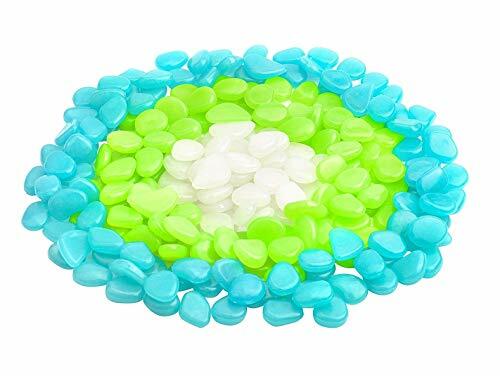 Package includes: 100 blue pebbles, 100 green pebbles, 30 white pebbles. Recommended for use over 3 years old and requires adult supervision. If you have any questions about this product by lailai, contact us by completing and submitting the form below. If you are looking for a specif part number, please include it with your message.